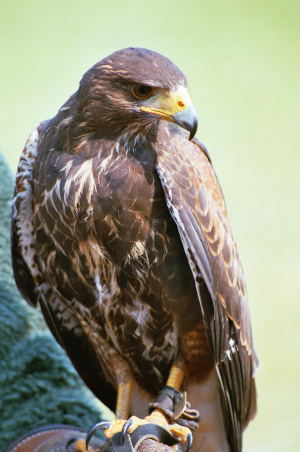 A bird of prey or raptor that is found on all the continents on Earth except for Antarctica. From the family Falconidae, which includes true falcons (Falco) and aracaras, a genus of falcons that feed on dead flesh. Falcons are unique because their wings are specially shaped to fly at high speeds with feathered plumes on their legs known as flags, and a beak that develops with a tooth specifically designed to kill their prey. All other birds of prey kill with their talons, not their beaks. Falcons are one of the fastest animals in the world and when they dive steeply they can reach speeds of 200 mph. "Buzzard Falcon" by Jürg from Sandesneben, Germany is licensed under CC BY.